most flexible cargo aircraft to enter the airlift force. 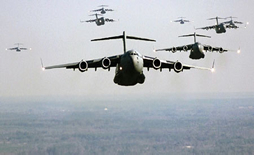 The C-17 is capable of rapid strategic delivery of troops and all types of cargo to main operating bases or directly to forward bases in the deployment area. The aircraft is also capable of performing tactical airlift and airdrop missions when required. 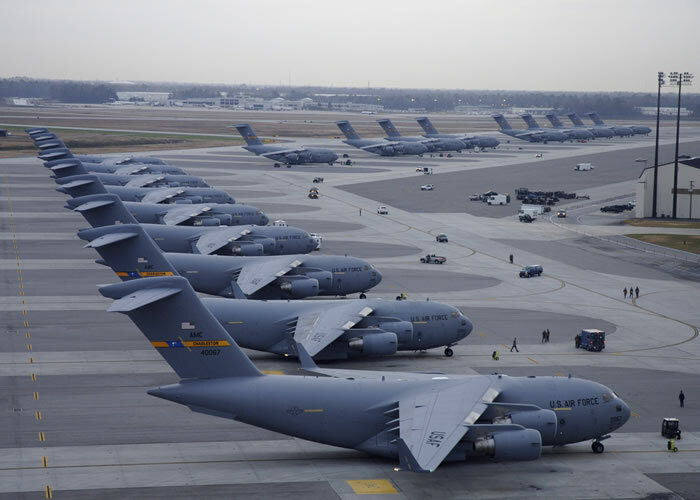 The inherent flexibility and performance of the C-17 force improve the ability of the total airlift system to fulfill the worldwide air mobility requirements of the United States. The C-17 measures 174 feet long (53 meters) with a wingspan of 169 feet, 10 inches (51.75 meters). The aircraft is powered by four, fully reversible, Federal Aviation Administration-certified F117-PW-100 engines (the military designation for the commercial Pratt & Whitney PW2040), currently used on the Boeing 757. Each engine is rated at 40,440 pounds of thrust. The thrust reversers direct the flow of air upward and forward to avoid ingestion of dust and debris. Maximum use has been made of off-the-shelf and commercial equipment, including Air Force-standardized avionics. The aircraft is operated by a crew of three (pilot, copilot and loadmaster), reducing manpower requirements, risk exposure and long-term operating costs. Cargo is loaded onto the C-17 through a large aft door that accommodates military vehicles and palletized cargo. 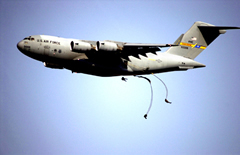 The C-17 can carry virtually all of the Army's air-transportable equipment. 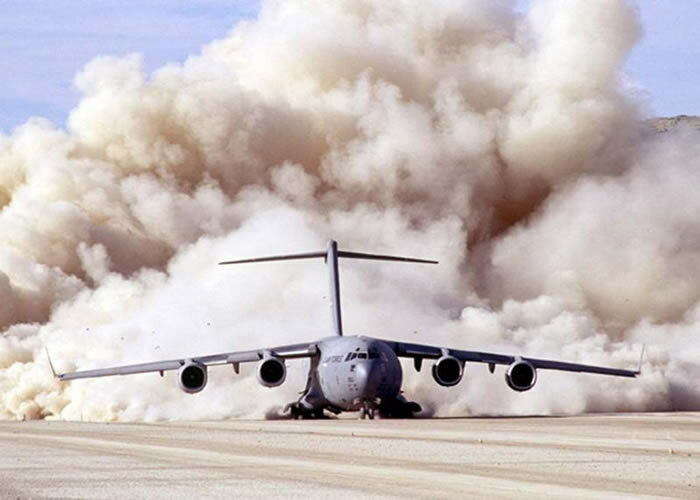 Maximum payload capacity of the C-17 is 170,900 pounds (77,519 kilograms), and its maximum gross takeoff weight is 585,000 pounds (265,352 kilograms). With a payload of 160,000 pounds (72,575 kilograms) and an initial cruise altitude of 28,000 feet (8,534 meters), , the C-17 has an unrefueled range of approximately 2,400 nautical miles. Its cruise speed is approximately 450 knots (.74 Mach). 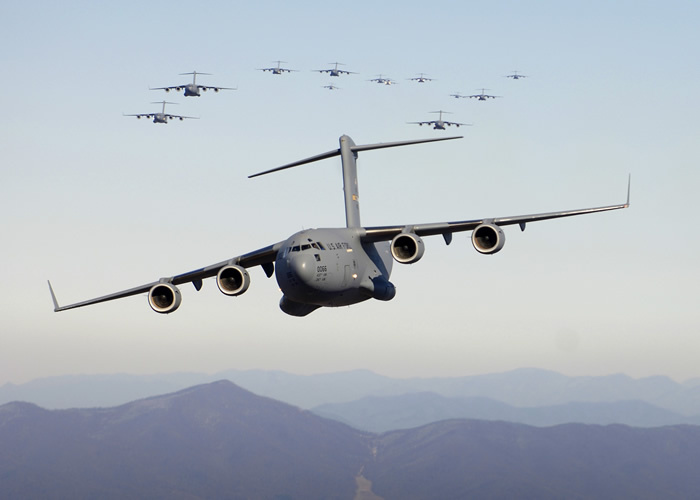 The C-17 is designed to airdrop 102 paratroopers and equipment. The design of the aircraft allows it to operate through small, austere airfields. 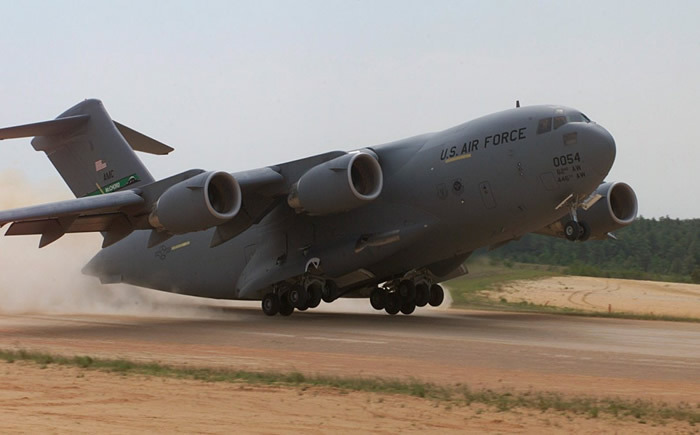 The C-17 can take off and land on runways as short as 3,000 feet (914 meters) and only 90 feet wide (27.4 meters). Even on such narrow runways, the C-17 can turn around using a three-point star turn and its backing capability. The C-17 made its maiden flight on Sept. 15, 1991, and the first production model was delivered to Charleston Air Force Base, S.C., June 14, 1993. 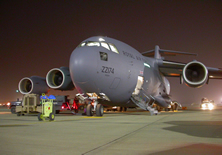 The first squadron of C-17s, the 17th Airlift Squadron, was declared operationally ready Jan. 17, 1995. The Air Force originally programmed to buy a total of 120 C-17s, with the last one being delivered in November 2004. Current budget plans involve purchasing 180 aircraft. The original 120 C-17s were based at Charleston AFB; McChord AFB, Wash., (first aircraft arrived in July 1999); Altus AFB, Okla.; and at an Air National Guard unit in Jackson, Miss. In September 2004, McGuire AFB, N.J. began basing the first of 13 aircraft expected by June 2005. The C-17 is operated by the Air Mobility Command at the 437th Airlift Wing, Charleston AFB, S.C.; the 62nd Airlift Wing, McChord AFB, Wash; the 305th Air Mobility Wing, McGuire AFB, N.J.; the 315th Airlift Wing (Associate Reserve), Charleston AFB, S.C.; and, the 446th Airlift Wing (Associate Reserve), McChord AFB, Wash; and the 172nd Airlift Wing, Mississippi ANG. Additionally, Air Force Materiel Command operates one C-17 at Wright-Patterson AFB, Ohio; and Air Education and Training Command operates eight aircraft at Altus AFB, Okla.